For our journey from Saigon to Phnom Penh, we decided to take the Mekong Express Bus service. Journey time is usually around 6 hours, although our bus took a little longer due to torrential rain and some flooding when we arrived in Phnom Penh. Click here to book a great hotel in Phnom Penh. The cost of this bus service is a very reasonable $13, and tickets can be booked online at catmekongexpress.com. I would suggest that you don’t get a seat near the back of the bus though, as the suspension isn’t great. Well, at least it wasn’t on our bus. The bus has a toilet on board, and water and snacks are provided free of charge. Once the bus reaches Cambodia, the bus also has free wifi, although coverage was pretty patchy. The seating on the bus was quite comfortable, although we found the bus to be a little too hot. At the beginning of the journey those that needed visas for Cambodia were given the forms to complete, and then we handed them in with our passports and the $25 visa fee. On reaching the Vietnam Immigration at the border we had to carry our bags through immigration so that they could be scanned. We were then stamped out of Vietnam and got back on the bus for the very short journey to the Cambodia Immigration at Bavet. Note: If you plan to stay in Cambodia for more than two months, you need to get a business visa and not a tourist visa – see Cambodia Visa Options for more details. At Cambodia Immigration we were given our visas and stamped into the country. A few minutes later the bus stopped for lunch. It was a simple and cheap lunch. A couple of large fresh spring rolls cost $1. We then continued our journey onto Phnom Penh, including a ferry crossing at the Mekong River. We arrived in Phnom Penh to torrential rain, and a flooded bus station. This meant that we had to divert to another bus station, and get a tuk tuk to our hotel from there. You can see our bus journey on the above video. This will give you a good idea of what the journey is like. For the first couple of nights we stayed at Amber House Hotel, which we booked through Agoda. 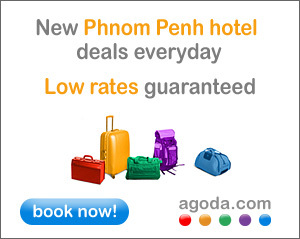 To book this or any other hotel in Phnom Penh, click on the Agoda link below. Click here to book a great hotel in Phnom Penh.